I very recently installed Windows 10 on my PC, and now I'm testing Cortana. I have followed some tutorials. 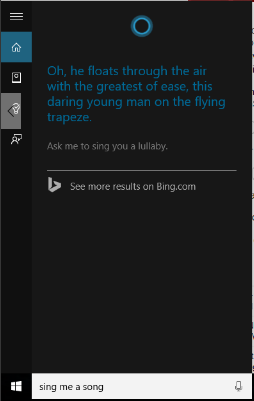 The problem is that Cortana responds to me only by text. I want Cortana to respond with her voice. How can I enable voice on Cortana? Cortana will only respond by voice if you speak to her by voice. If you'd like a voice response, press Windows+C or click on the microphone icon and speak to Cortana through your microphone. If enabled, you can also just say "Hey Cortana". Check what your sound is set to like if it is running through speakers or a headset, if it is running through speakers and no speakers are plugged in you wont hear a thing, just make sure it is on the correct setting you can go through sound system or the volume icon at the bottom of your screen. that is what happened to me my setting was on the wrong one and I couldn't hear cortana. How to know if Windows Cortana sending information to Microsoft even if you disabled it?